Property 2: Modern apartment with air con & WiFi. Private roof terrace with great sea views. Property 13: Apartment 600m from La Barrosa beach, with swimming pool and paddle tennis courts. Property 14: Luxury Penthouse in Conil de la Frontera - Breathtaking Sea views. Property 22: Penthouse with large terrace and solarium with sea views, beach 150m. 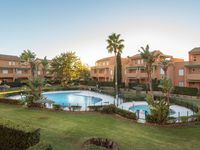 Property 36: APARTMENT IN MIRADOR DE LA FONTANILLA WITH WIFI. Property 38: Come, we wait with affection in your second home. It was a quiet place. Towel from your company where clean and confortable. We had problem with the heater (in the apartmebt it was only 14 C&deg;), the replacement was quickly. Gap under the apartmendoor was the reaso why it was windy and cold in the apartment. Pick up the key. meybe the doorbell didn't work. We had to wait until someone left the officebuilidung. Also it took long until looks out of the office.